You probably need to add a big splash of red paint on the front and attach a sign on the back that says "It's not real fur, der ..." Unless it is real fur and I didn't read your blog properly. Then you need to add the red paint and then put on the back "This was killed 50 years ago. I would never buy farmed fur these days." Or perhaps "PETA and me, we don't agree." I don't agree with PETA and their policy on mulesing, but then I have seen fly blown sheep and many people haven't. My other was "This is more petrochemicals than pelt." Okay ...enough said. You have given pause for thought. keep the vest and the dress! I have a fur-trimmed cape (vintage, I would never buy new fur) and I get a lot of comments everytime I wear it. Most are, "don't let the paint-throwers see you" which is a weird thing to say. I think people are intimidated by fur, real or fake. I know what you mean about trends... I am having a hard time with desert boots right now. Would I love them if they weren't trendy? Anyway, you look marvelously elfin in these photos. Most people are afraid to stand out and personal style means that sometimes, you don't look like everyone else, and that's amazing!! Don't let the scared ones keep you from doing what you do so well!! 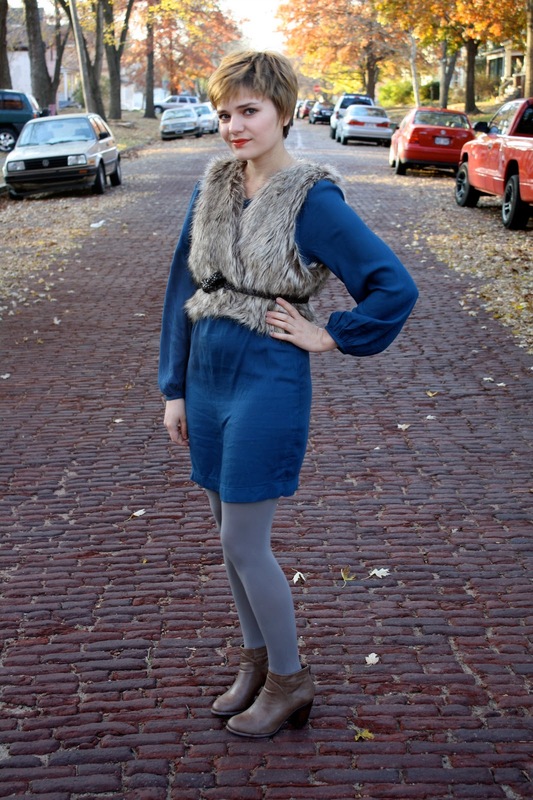 I love the vest and personally wear my faux fur vest whenever I get a chance! Though mine does not look nearly as real as yours does.... either way, rock it with pride! I can see why you refused to leave the dress behind! I love the sleeves and the color is gorgeous. Sometimes I can't help but let it get to me even though I know I shouldn't let it! I love what Between Laundry Days said about some things being more appreciated in the blog world than in real life. So true! WHAT? I LOVE this! People are silly! Rock whatever you want, looks great!! Who wouldnt like the fur vest?? I have the same problem, people keep telling me how ugly my fur vest was it broke my heart but I keep wearing it, I LOVE IT!!! I love fur vests so am slightly bias but I know what you mean, I have a huge white yeti coat which I love but won't wear around certain friends as they mock me all day for it. the dress actually really looks like the new Biba designs from what I can tell. I LOVE that vest. Don't listen to the haters! Love the faux fur (or is it fantasy fur now?) You should definitely wear it with pride, as you look so good in it. Love the vest! There are sometimes outfits you wear that I don't connect with - and of course this happens with anyone courageous enough to post their outfits, no one is going to love everything - but THIS outfit ain't one of 'em. You look dashing, and the color of the dress is fantastic on you! Please, don't stop wearing this combination. Where I live I feel like I'm stared out whenever I wear anything different (it doesn't help that I'm a giant) but I don't let it get to me. Wear anything you want to lady. That color and combination is dreamy anyway. I love your vest and your hair. You look so fabulous!!!! I actually love the faux fur vest! It's really cute! I'm originally from South Dakota and, as much as I love my home state, I can tell some people think I'm "trying too hard" when they see my outfits when I go home. I'm sure there are plenty of fashionistas in SD, but I do think location can affect people's clothing outlook. No worries, though. You look great; wear what you want! I'm liking the vest a lot and think it'd look lovely with a pair of skinny black jeans and quiet top. Maybe it's the drapey fabric paired with the fur that unsettles people? (i.e. a visceral textural response?). I'm surprised that you get strange looks in Lawrence--I haven't lived there in years, but it always seemed fashion conscious for a small midwestern town. Lawrence had better and more unique fashion than Austin! LOVE the fur vest. Keep rocking your outfits.....you look great and inspire me to let my creativity show! I have a similar debate with myself about wearing things that seem noticeably out of the norm. Fur is one of those things. Also, crazy hats. I generally wear them anyway, as you did, but sometimes I wonder if impractical trends are worth the distraction and stare-factor. For now I'm saying yes, largely due to how awesome you look in your vest. It's gorgeous against the rich blue of your dress and really works with the shape of your outfit. LOVE this vest.. soooo cute and great with the blue. Ilook like a saskquatch in vests like this and am envious.. I wish I could wear them.. love it! !